Things are finally starting to settle into place after all the adjustments we've made in our lives recently. I stay busy all the time running from job to job and home again, but we've all fallen into our own routines and its not that bad. John is on his winter break from school. I'm so proud of him, he made a 4.0 GPA this past semester. Thomas is enjoying school a lot. He made "Student of the month" for December. Nathan is starting to talk more. He has the same personality of his daddy, hard headed and out spoken. When you point your finger at him and tell him NO, he points his finger back at you, scowls, and says NO. Its hard to believe how the time has flown. It seems like it was Thanksgiving yesterday and now its already Christmas Eve. As busy as our lives have gotten in the past 3 or 4 months, and as stressful as things may have seemed, I still have to say that life is good. Just dropping in for an update. Life is still CRAZY busy. I'm so exhausted that sometimes I feel like I'm turning into a mindless robot that does what it needs to do on auto pilot. However, there is an up side which is that I'm making enough money to pay the bills and of course my 20% discount off of sales prices at JC.Penney's. My mom has been here visiting since September 16th. I believe she will be going home October 6th. That will be a very hard day for me. She has been so incredibly helpful with the kids and supporting me and John in the midst of all this chaos. John is doing great in school. The math seems to be easy for him. Chemistry, he has to work a little harder at. History is not hard, just time consuming with all the reading and papers he has to write. and English seems to be a breeze. My birthday was September 20th. I can't believe I'm 24 now. My mom threw me a little party and John's dad and step mom and Aunt Cathy came over for dinner. It was really nice. I really enjoyed seeing everyone. I miss my sister in laws Debra and Erin and friends from the moms group so much. I have a short break from work today from 9am to 2pm. I am busy cleaning the house for Thomas' party this weekend and also the arrival of my godmother today. Thomas has a birthday on Sunday. My baby is going to be 4! We are having a family birthday party for him on Saturday evening. I have to work all day Saturday so John, My mom, and my godmother are going to be putting the party together and then hopefully I will make it to the party before everyone goes home! Got a minute to catch everyone up to date. Right after I wrote my last blog both employers called me within 20 minutes of each other to schedule my training. I am now working in the Mens department at JCP in the Chesapeake Square mall and at North Shore Elementary school in Suffolk with a program called Champions: A before and after school program that partners with the Suffolk and Norfolk public schools. My schedule is CRAZY. I'm busy pretty much every day of the week all day long. If I'm not working at one job, I'm at the other and at night I'm off from both of my jobs but spending time with the boys while John is at School. 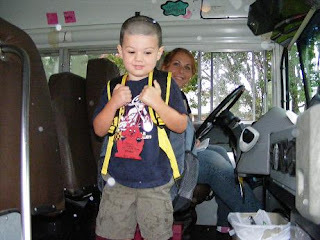 Speaking of school, today was Thomas' first day of Pre-k. Of course I was at work when Thomas got on the bus this morning :0( ... but John took pictures. John got Nathan dressed and they met Thomas at school to make sure he got there ok and everything was fine. The cafeteria lady gave Nathan a pop-tart for breakfast while they were waiting for Thomas. When the bus got there John said Thomas walked into the classroom, hung his book bag up and got right to work playing with play dough. John gave him a hug and kiss goodbye and left and Thomas was OK with that. I'm SO proud of my BABY. He is growing up SO quickly! You don't realize how fast the time is going until you reach one of these milestones and it reminds you just how much time has really passed. It brings tears to my eyes just thinking about it. 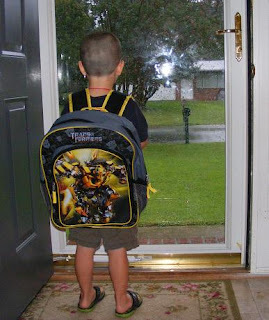 I can't wait for Thomas to get home and tell me everything about his first day of school! I feel like Life is a balancing act right now and I'm still trying to get in the groove of things, but overall life is good. Oh man, where to begin. John and I have both been un-employed for a full month now. It hasn't been that bad. We've had a lot of fun just spending quality time with the boys. However, I'm starting to freak out now because I don't see the end of the unemployment and the beginning of an income finally coming in again anywhere in site! I supposedly have gotten 2 part time jobs, but neither has called me back to let me know when training starts and I interviewed with both of them 2 weeks ago. It only takes 5 days for the background check to go through so I don't understand what is taking so long. I'm starting to get worried that they changed their mind about hiring me. I've heard over and over again that persistance is the key to getting a job. So I've made calls to both employers. No answer...so I'm just waiting for a call back. I found out that with the GI Bill giving us a housing allowance and the pell grant giving John a little bit of money each semester to go to school John and I don't qualify for medicaid. Sorry, but I personally feel like that is ridiculous. My expectations may be too high but I feel like my husband is deserving of more than what he is getting after everything he has been through and done for our country. Oh well, I guess its going to be another year for us without health insurance. The good news is the boys do qualify for medicaid! So atleast we don't have to worry about them. School is going well for John. So far, so good. Speaking of school Thomas has orientation in only 2 days. I'm nervous for him, but mostly just excited. He seems to be starting to accept the idea of going to school. He's come leaps and bounds from a few months ago when we started talking about school. At that time he told us "I'm not going to school, I already know everything I need to know from my science books". I think his change in attitude mostly had to do with the fact that daddy started going to school and Thomas doesn't mind doing anything that follows in daddys footsteps. I guess thats all thats going on for the moment. Well, finding a job has not proved to be an easy task. I've put in application after application online and had NO luck. I am determined to stay positive. I know things will come together. They always do! I found out that one of my friends in the moms group I belong to just got a job at outback in Chesapeake Square. With a little coaching from her on how she got the job I have decided to go to all the main restaurants in Chesapeake square in person and pursue a waitress or hostess job. If that doesn't work I'm also looking into a job at a Christian school assisting with their day care program. So although its been discouraging thus far I'm still going strong! John got his books for school today. 5 classes=$700.00 in books! I'm SO proud of myself for not freaking out. Having 60 college credits under my belt and having experience with the way things work with text books in college probably has something to do with me keeping my cool. I knew it was coming...Anyway, we just keep moving forward. Thomas and Nathan got their immunizations today. Thomas had a REALLY hard time with the shots. It came down to physical restraint to get it done. WOW. Talk about your heart breaking for your babies. One of the positives of John not having a job is being able to help get these things done. I stood outside with Nathan while the shots were being given. Thomas kept screaming he wanted ME. I honestly don't think I would have had what it took to hold him down. For a 4 year old that boy is STRONG. Poor Nathan got SIX shots. 2 in each leg and 1 in each arm. He took it like a champ. The younger they are the easier it is to just get it over with and move on. It's funny because if you had been in the other room listening to my children howl and not known what was going on you would have thought it was the end of the world! But as soon as the nurse busted out a lolli pop for each there was silence. Funny how a lollipop can make EVERYTHING better for a child. Wish it was that way for adults ;0). This was originally a blog to keep everyone up to date with all the changes occurring in our lives when John quit his job and went to college. I will continue to blog about that but I find it hard to stick to one specific topic in my blogs. When I get on here to type; whatever is on my mind is what comes out in my blog. Sometimes it can get pretty random. As far as whats happening with John. He has registered for his classes. Starting August 20th John will be taking night classes from 7-9:30 Monday through Thursday . This is exciting because he will have friday, Saturday and Sunday to rest, relax, and study. I'm still looking for a job. Temp agencies are on my to do list for tomorrow. There are a lot of exciting things coming up in the next few months. 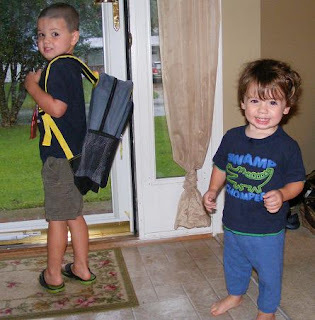 Thomas Will be starting pre-school September 8th! My mom will be coming to visit from September 16th until October 6th. We are going to Williamsburg for a two night stay at the Ramada inn on September 18th through the 20th. September 20th I turn 24! and then 7 days later Thomas will be turning 4! Lots to be excited about! This is my favorite time of year. There always seems to be lots to look forward to around this time each year. I guess thats all for today.